During the holidays, I try to stick to one principle – avoid watching the markets, take a break from all the charts, analyses, and various information. But I am trying to take it easy. So it has happened also this year. From my previous analyses made before Christmas, I had some interesting opportunities marked. Therefore, I had pending orders in the trading platform, which most of them have been gradually accomplished. So now I’m holding four spread positions. Precisely, the bear spread on oil, pork and soybean oil and one bull spread on wheat in Chicago. For the beginning of the year, this is a fairly decent portfolio. Of course, all these opportunities have been analyzed in advance in the Spread report. Therefore, the subscribers did not miss anything. Today I will describe other trades. 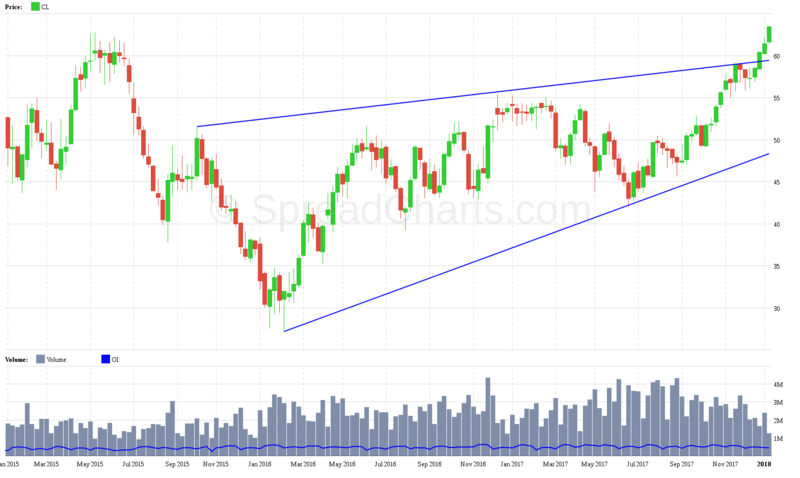 I have analyzed the oil many times here on the blog and also in the reports. Recently, it’s a very interesting market and I’m curious about its future. The idea of this opportunity lies in the expected correction after a rapid growth to over $ 60. The market is extremely overbought, so I think the correction is inevitable. However, I do not think that this decline will be as fast as at the end of 2014. In any case, the rebalancing of the market before the next growth must come in my opinion, and I want to use it through the bear spread. I have opened a very narrow spread CLN18-CLM18. 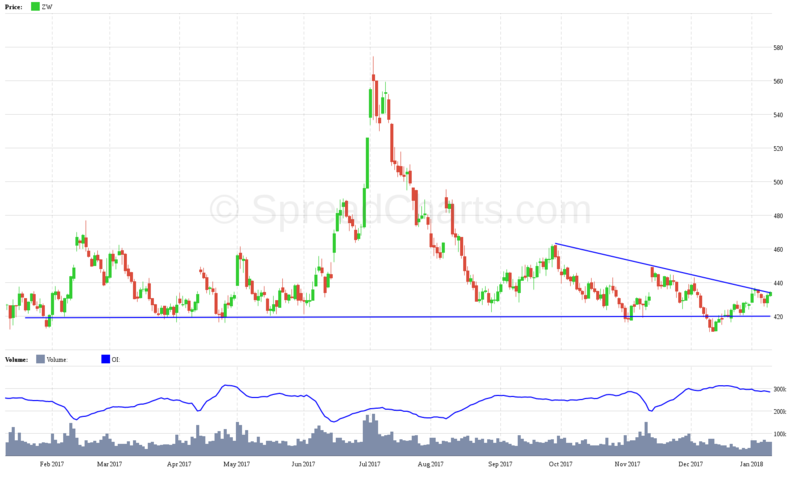 Spread has moved to a very low level and shows signs of consolidation, after which I expect further growth. My average entry price is $ 0.29. 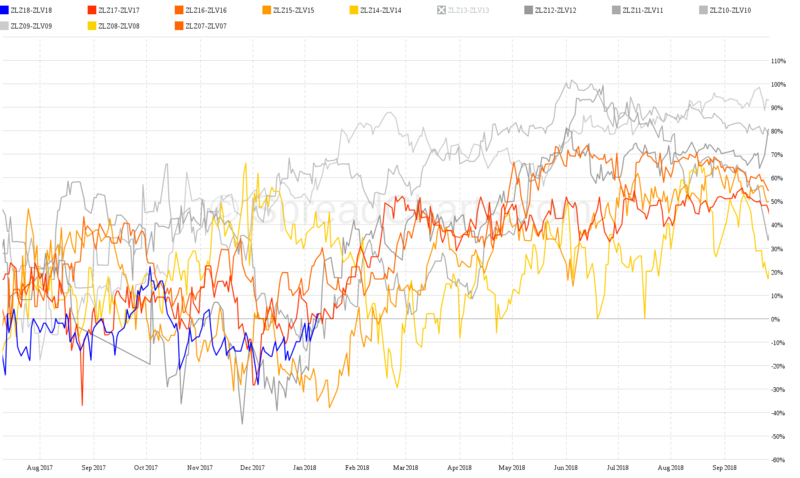 Seasonality is very interesting here. 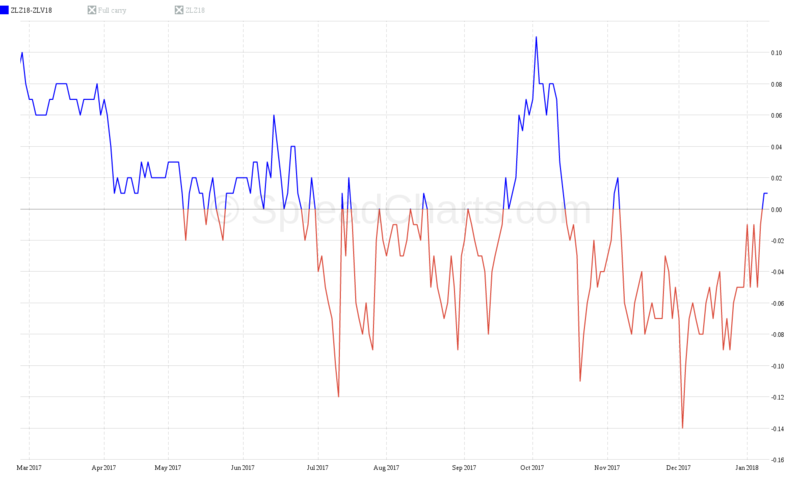 Except for one year, the market has always turned into contango between two contracts. But here I am very careful. 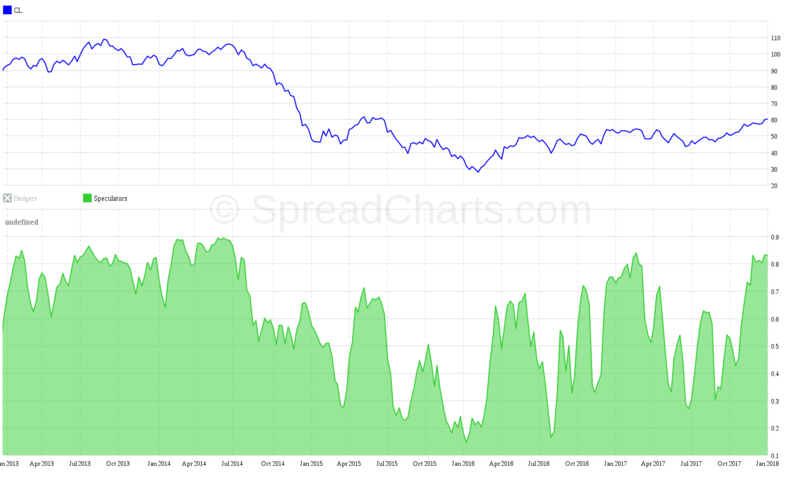 The oil market has changed and may not be strictly following the seasonality this year. 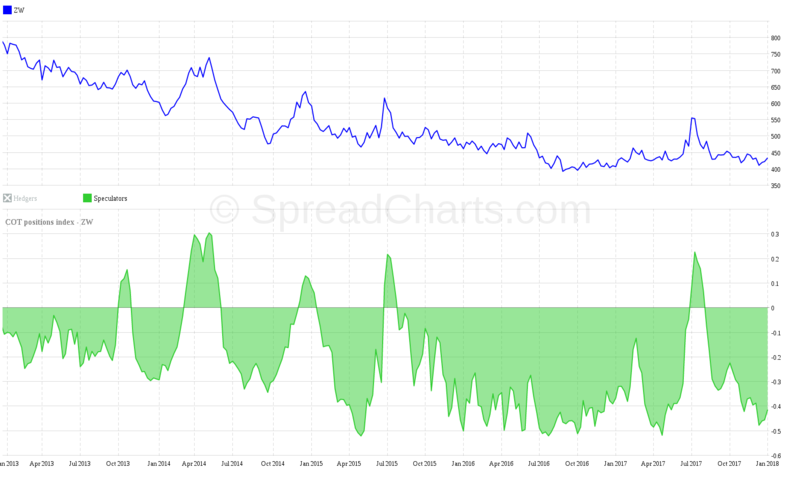 Spread can still stay in backwardation, like in 2014 (yellow curve). I have described this opportunity in the Spread report before Christmas. 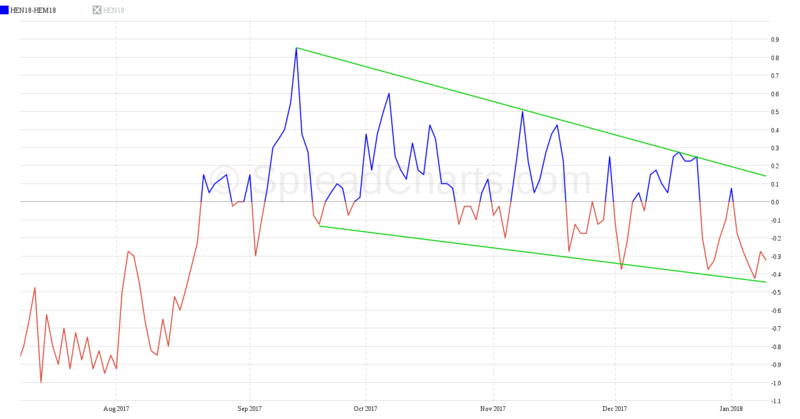 I chose a narrow spread HEN18-HEM18, which moves in a very interesting pattern – a falling wedge. I have managed to enter on the lower side, ie. at price -0.4c. COT analysis can be described as slightly favorable. 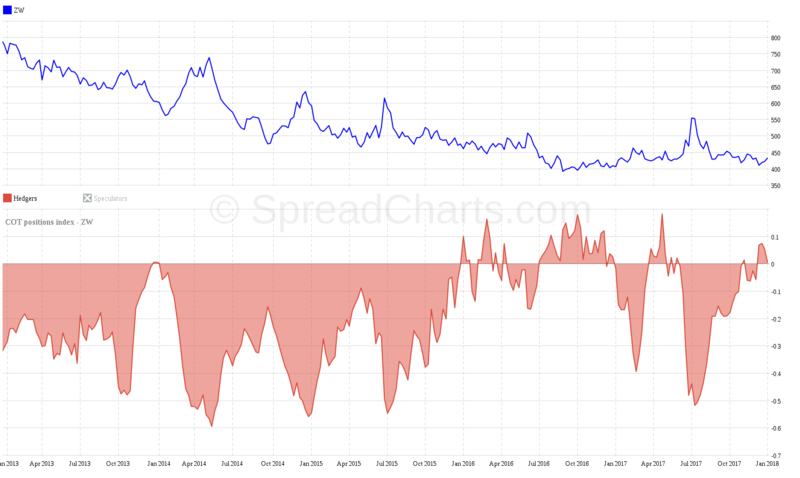 COT Curve indicators are in the overbought area. However, the technical analysis of the June contract warns me that the price could break up. I’m going to watch this closely. 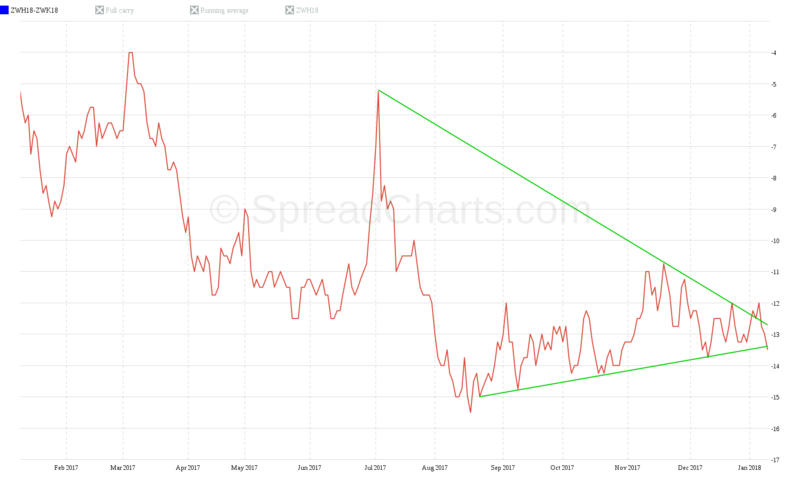 In such case, the spread could even break through the channel. In this position, I have a tight stop loss and I still hold only a small position. 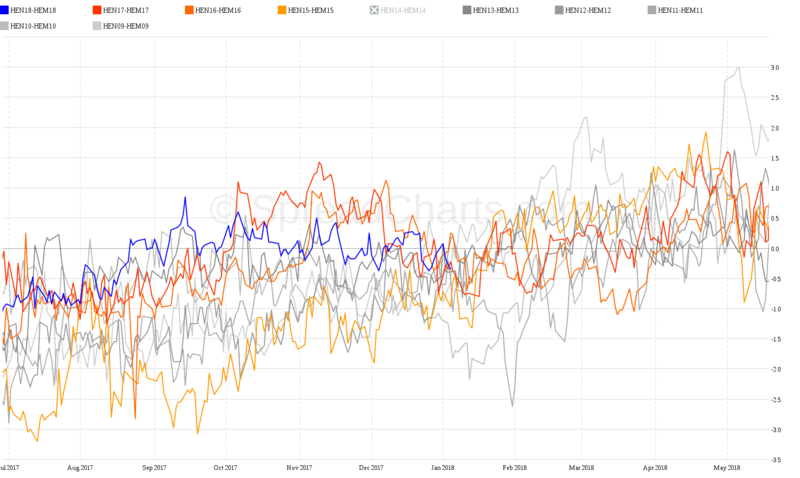 However, a detailed analysis of seasonality shows a very favorable period in the coming months. This position is remaining from the last year. I’m only holding a “mini position”, unfortunately, the rest was not opened. The main reason I went for the trade was a full carry analysis. 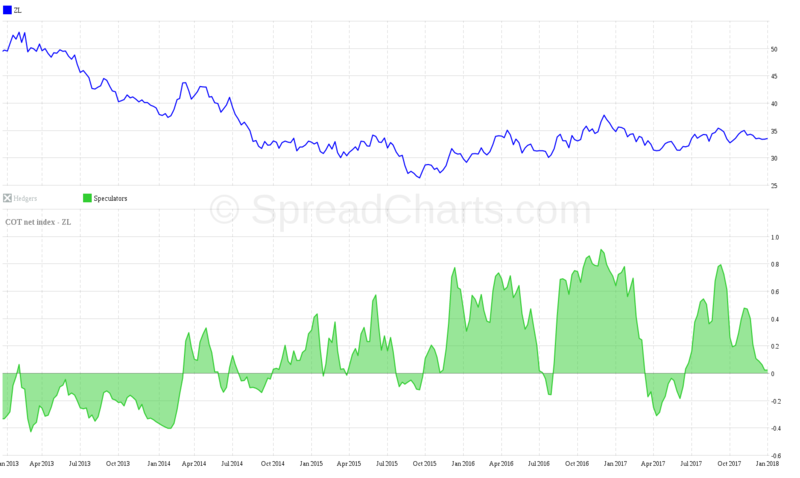 It still tells me that the spread is cheap and has a favorable season ahead. Overall, the opportunity is not so great. A group of big speculators reminds us that the market can already be oversold, and the underlying asset can grow again. 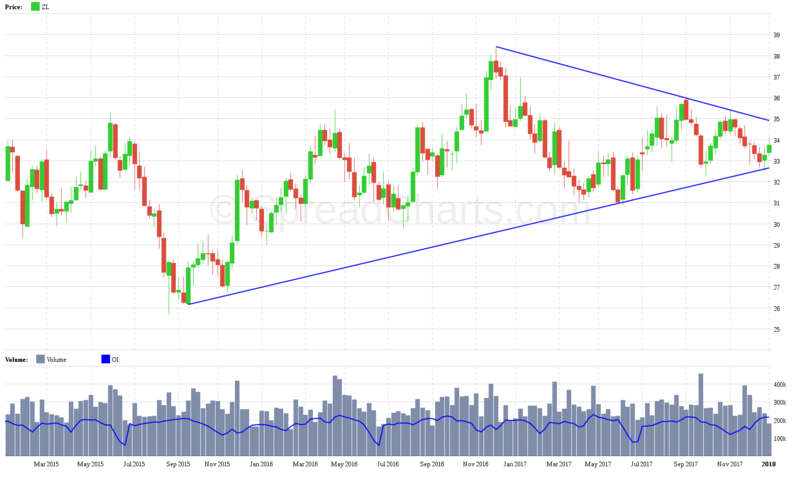 In addition, with technical analysis, we can see the refusal of futures prices to drop below the support to a trendline. And that’s not all. The structure of the market that allows us to look deeper into the market points to a short-term strengthening of the market. The nearest bull spread grows despite the drop of the underlying asset, all this even if contango is present (bull spread is negative). Therefore, I do not plan to increase my position. On the other hand, often the contango here has a large impact and its effect is known mainly over the long term. 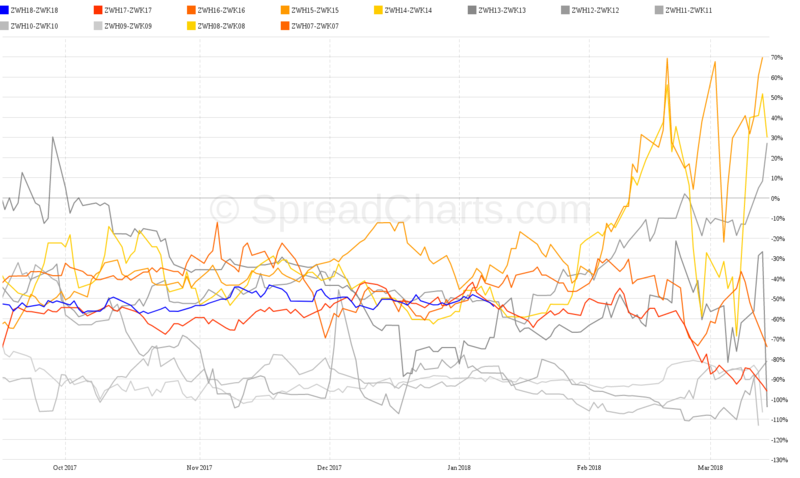 Therefore, there is still a chance for a return to contango and a slow but steady growth of the spread. 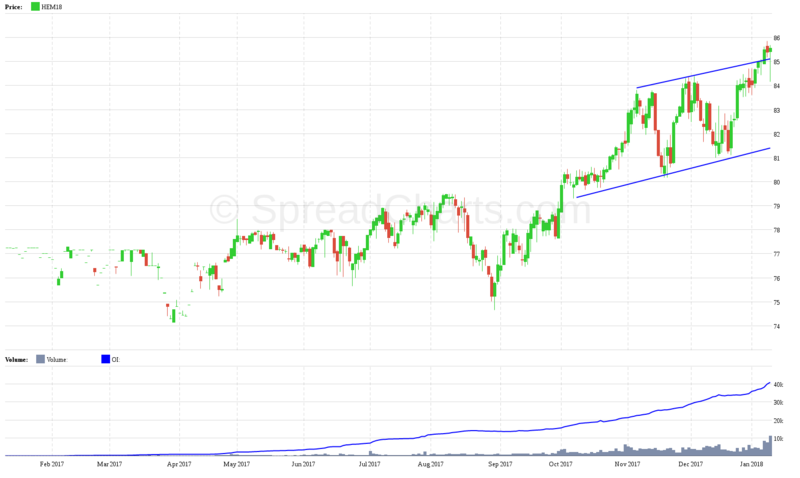 Even though the bear spreads have a high success rate in the long run and should form the main part of the spread portfolio, it is also good to occasionally hold a bull spread. This may partly work as a kind of a security tool. 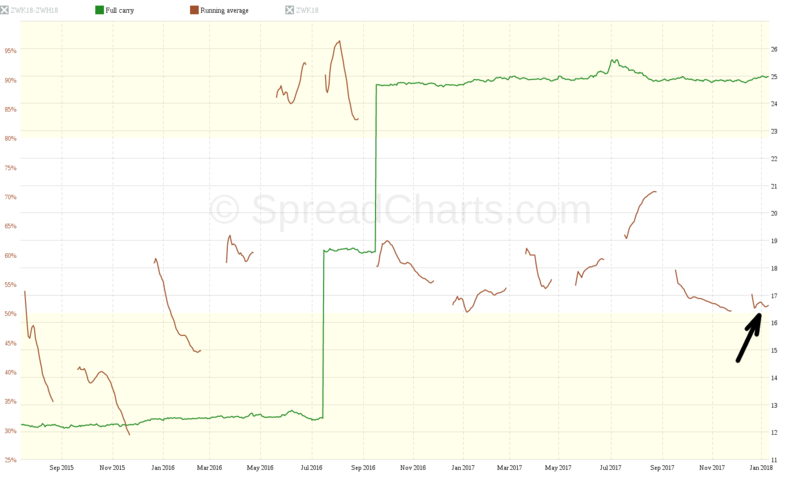 If something happens on the market, bear spreads can fall sharply. In such case, the bull spreads will come to the front. For example, if the oil correction will appear later, and oil will grow for some time, it may also encourage the growth of other commodities. 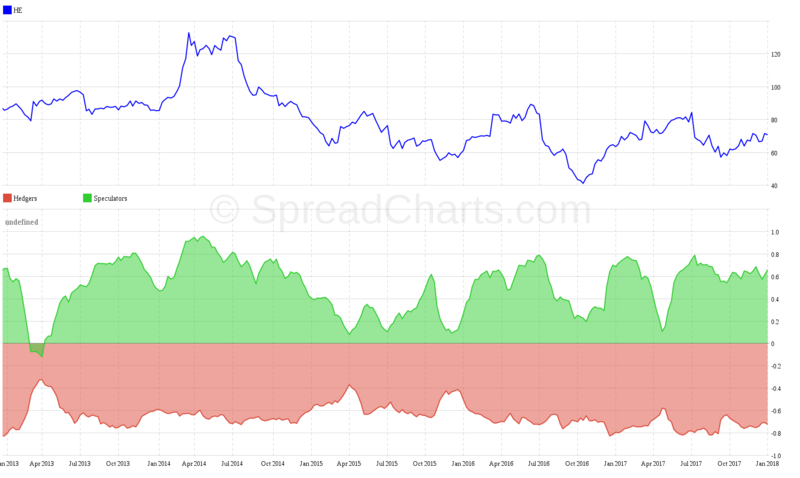 Which is disadvantageous for bear spreads, but on the other hand it is advantageous for the bull spreads. 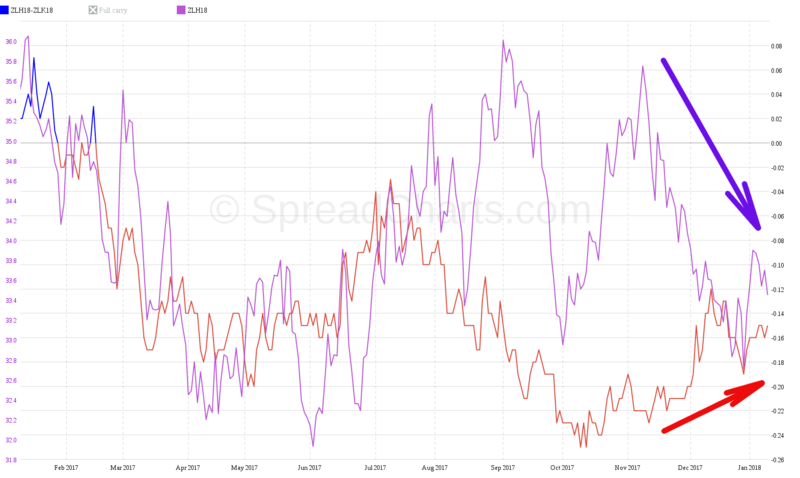 I like the bull spread on wheat for several reasons. 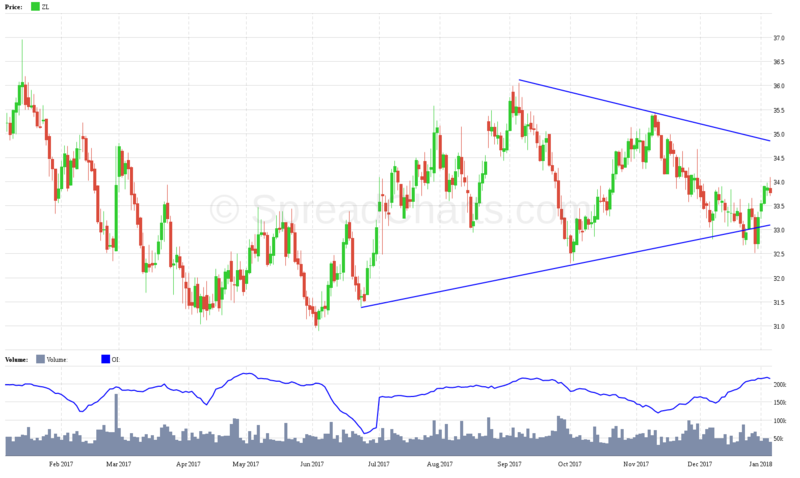 The market is currently extremely oversold and the price is also close to a strong support around 420 cents. 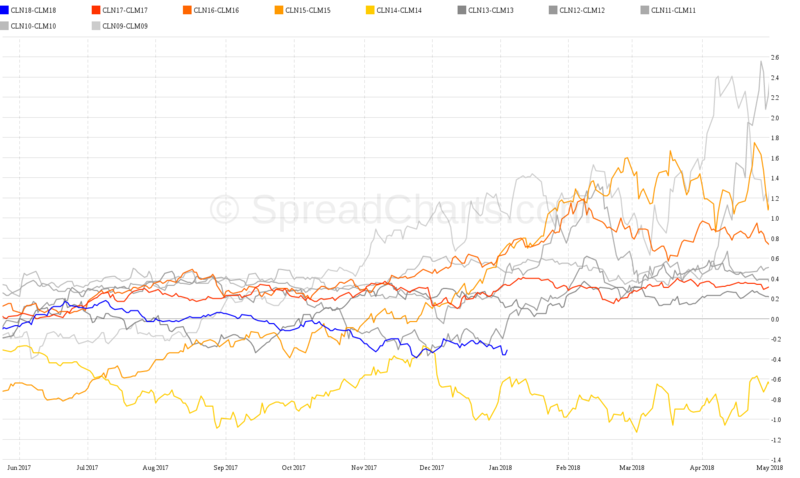 When it comes to wheat, the best bull spread is the ZWH18-ZWK18, as you can see also from the full carry analysis. It indicates the upcoming favorable period with a growing tendency. 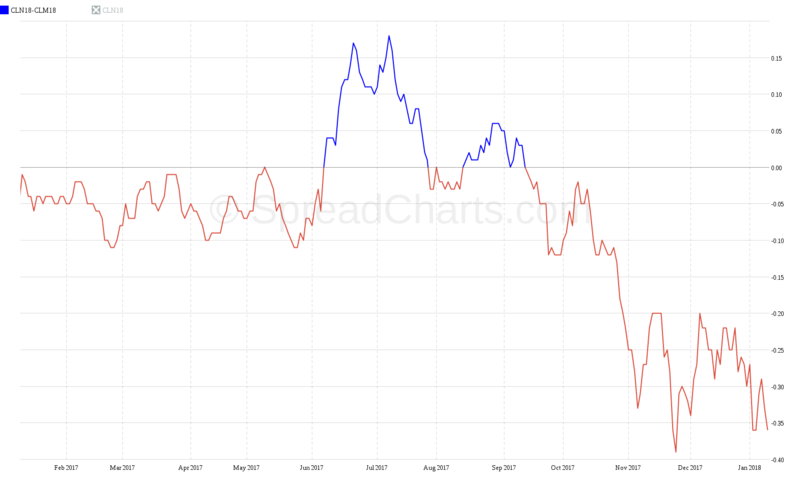 When it comes to the price of the spread, with regard to the last few years the spread is neither cheap nor expensive. The analysis is therefore rather neutral. A further kick for the bull spread could happen if the storage rate is changed. But this can be predicted using the so-called running average for full carry analysis. I will not explain it today because it is not a simple thing. You just need to know that it will be positive for the bull spread if the end of the brown “worm” that is indicated by the arrow will be in the yellow area, below 50% (worm will end by 23.2.2018). In that case, the storage rate drops, which can cause pressure on the bull spread towards up.